Born in the Scottish town of Stonehouse, South Lanarkshire, on the 3rd June 1918, Archibald (Archie) Mathies was to become a Second World War hero. He was awarded the Medal of Honour (MOH) for his actions whilst at RAF Polebrook (USAAF Station 110) in Northamptonshire, England. It would be on the 20th February 1944, shortly after arriving at Polebrook, that he would earn this honour but his life would be dramatically cut short. Not long after his birth in Scotland, Mathies moved with his family to the United States, to a small town in Western Pennsylvania called Finleyville, in Washington County. After leaving school, he began work in a local coal mine. The work was hard, and the pay was low; Mathies was not inspired. Then, following the Japanese attack on Pearl Harbour, as many other brave young American men did, he joined the Army, enlisting in Pittsburgh on the 30th December 1940. 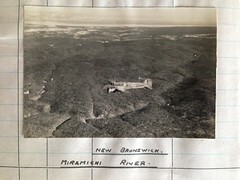 Mathies would transition through a number of stations and training centres before finally completing a course in aerial gunnery on the 22nd March 1943. His last U.S. posting was to the 796th Bombardment Squadron at Alexandria, Louisiana for operational training duties flying B-17s. He would leave here on the 8th December 1943 bound for England and the European Theatre of Operations. Mathies arrived in the U.K. eight days later. His initial assignment was with the Eighth Air Force Replacement Depot, before being attached to the 1st Replacement and Training Squadron. On the 19th January 1944, he received his first and only operational squadron posting; the 510th Bomb Squadron, 351st Bomb Group, based at RAF Polebrook, as an engineer/gunner. Promotion was swift, and on 17th February 1944, probably following his first mission, Mathies was awarded the rank of Staff Sergeant. A few days later, on 20th February 1944, the allies began the enormous aerial campaign known as ‘Big Week’. During this short period a massive number of aircraft would attack targets deep in the heart of Nazi Germany. One of the first, (Mission 226) would see a total of 417 aircraft fly from airfields across England. 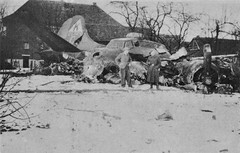 From RAF Polebrook, 39 B-17s took off to attack Leipzig. 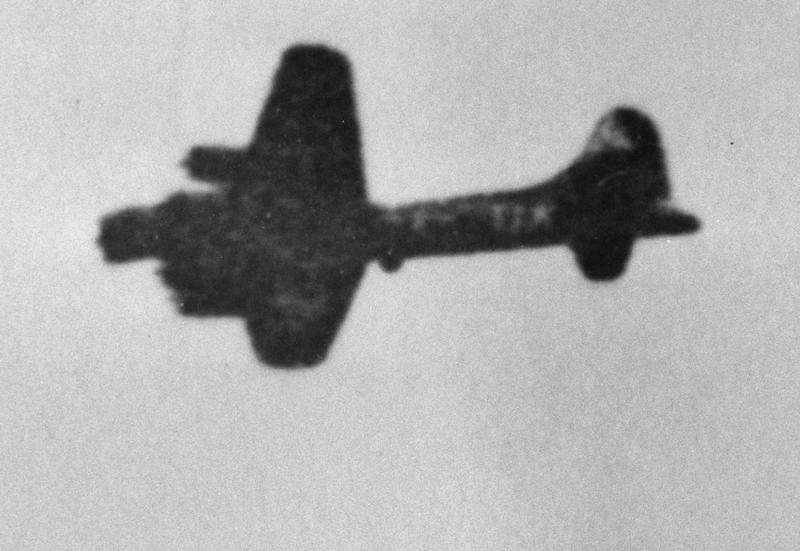 In the lead planes were Maj. Leonard B. Roper (s/n O-734101 ) of the 510th BS forming the high group, and Maj. James T. Stewart (s/n O-659405) of the 508th BS, leading the low group. Flying in the number three ship of the lower Squadron, in B-17 (42-31763) ‘Ten Horsepower‘ was: Pilot: Clarry Nelson, Co-Pilot: Roland Bartley, Navigator: Walter Truemper, Engineer / Top Turret Gunner: Archie Mathies, Bombardier: Joe Martin, Radio Operator: Joe Rex, Ball Turret Gunner: Carl Moore, Waist Gunner: Tom Sowell, Waist Gunner: Russ Robinson, and Tail Gunner: Magnus Hagbo. 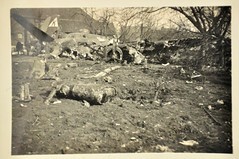 A B-17 believed to be “Ten Horsepower” (TU-A, serial number 42-31763) taken prior to its crash”2. On approaching the target, the formation was hit hard by fighters and flak, who would attack the formation for over an hour, hitting many aircraft in the subsequent melee. Ten Horsepower, was targeted repeatedly receiving many hits from 20mm cannon shells. In these attacks the co-pilot was killed and the pilot knocked unconscious from his wounds. 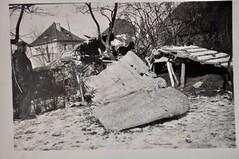 Fearing the bomber was doomed, the bombardier jettisoned the bombs and then bailed out, later being captured by the Germans and becoming a prisoner of war. 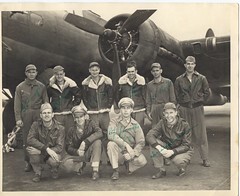 The remaining crew remained with the B-17 which soon began a deathly spiral toward the ground. Mathies and the navigator (Walter Truemper) would eventually take over control of the aircraft and nurse it back to England. Once over their base at RAF Polebrook, the crew were instructed to bail out but both Mathies and Truemper refused to leave the injured pilot. After deliberation, they were given permission to try to land, the remaining two crew members prepared themselves for a heavy landing. 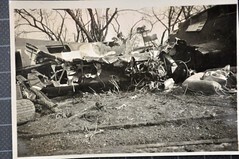 The first two attempts had to be aborted, but on the third attempt, as they approached the airfield, the aircraft struck the ground, killing all three crew members onboard. 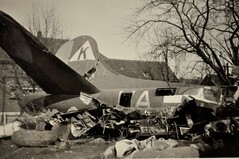 The crash was a severe blow for the base, both air and ground crews were devastated. On returning from the mission, five other aircraft (42-38028, 42-38005, 42-39760, 42-39853 and 42-6151). 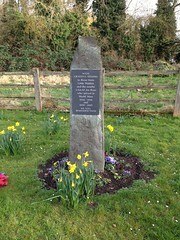 were forced to land at nearby Glatton (Conington) only a short distance away. This was only Mathies’ second mission and sadly, his last. For his bravery, Mathies was awarded the Medal of Honour; his name now appears on page 280 of the St. Paul’s Cathedral Roll of Honour. Also, as a dedication to him, one of the temporary lodging units at the Joint Base Anacostia-Bolling is named after him, as is the Airman Leadership School at RAF Feltwell, and the Noncommissioned Officer Academy at Keesler AFB, Mississippi. In addition, the bridge on Truemper Drive crossing Military Highway at Lackland Air Force Base, Texas; the USCIS Dallas District Office and the Mathies Coal Company in Pittsburgh, Pennsylvania, are all named in his honour. Mathies was truly a brave and dedicated man, who in the face of adversity, refused to leave his wounded pilot and friend. Daring to land a badly damaged aircraft, he sadly lost his life showing both great courage and determination. *1 Photo from Malmstrom Air Force Base website. *3 Citation taken from: US Army Centre for Military History website. Building 456 at March Air Reserve Base is dedicated to the memory of Seargeant Mathies also! Thanks for the additional information Steven, much appreciated!